As a rule, I don't normally carry a camera on me although I often wish I had it with me - or that I knew how to coax my phone to transfer files to a computer. However, I happened to be armed with it yesterday and, as you can see, I put it to good use in Milton Road where I encountered a cheerful young soul with a guitar braving the traffic and the speed humps to have his photograph taken by a proper photographer a few metres away. I thought he might be famous, so I asked him to tell me who he was (the last time I did this it turned out to be Orlando Bloom, so I was full of hope). 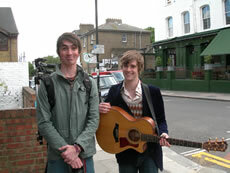 He said his name was Ali Warren, and that he is a solo artist and also plays with a band called Mantelpiece. Ali told me he has just moved to Acton from "the depths of the West Country in Somerset". When asked why he had chosen Acton, he said "It was the place we found with the most trees." Ali says he will be performing at the Rocket at some point. 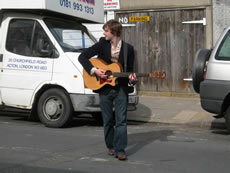 Meanwhile, you can catch him in Campden tomorrow (May 20th) at Under Solo and in Archway on May 28th at the Hideaway. Ali describes his solo music as blues/folk roots music. 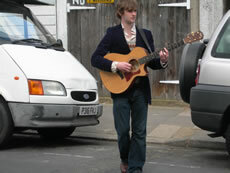 Who knows - his name could be added one day to the long list of famous musicians to have walked the streets of W3.